A healthy diet includes foods such as fruits, vegetables, nuts, oils, and whole grains, which contain important nutrients our bodies need. These foods also contain bioactive compounds with potential to promote human health. One food that contains many bioactive compounds is rice bran. Scientists with the Agricultural Research Service (ARS) recently examined the potential of colored rice bran to help with diabetes management. Diabetes is a metabolic disease in which the body’s inability to produce any or enough insulin causes elevated blood glucose (sugar) levels. Finding ways to enhance the health benefits of rice and other agricultural commodities is one of the goals of chemist Stephen Boue and his colleagues at the ARS Southern Regional Research Center in New Orleans, Louisiana. Joined by chemist Ming-Hsuan Chen at the ARS Dale Bumpers National Rice Research Center in Stuttgart, Arkansas, they examined the ability of colored rice bran extracts to stimulate glucose uptake in the fat cells of mice. “Our research showed that mouse fat cells exposed to red and purple rice bran extracts had significantly increased glucose uptake,” says Boue. For people with diabetes, glucose management is essential. Medications are used to improve glucose uptake, but they can have side effects, such as diarrhea or other intestinal problems, Boue says. These drawbacks have spurred increased research to find natural foods and supplements that can help manage the disease. “Another way to manage diabetes is to reduce the breakdown of starch to glucose during digestion by targeting particular enzymes,” Boue says. 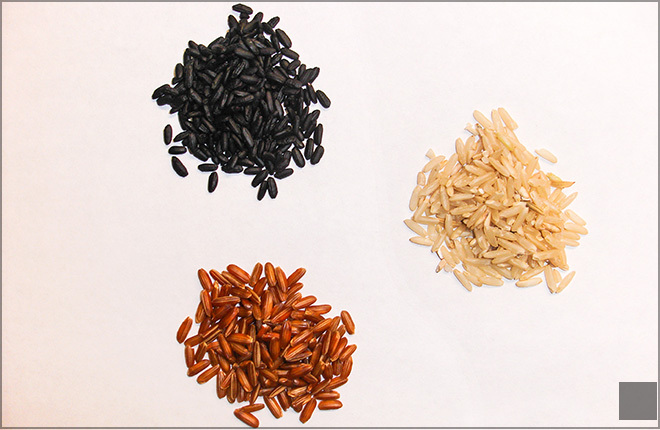 In their study, published in the Journal of Agricultural and Food Chemistry, Boue and his team looked at the effects of brown, purple, and red rice bran extracts on two digestive enzymes—α-amylase and α-glucosidase—and on glucose uptake. Glucose uptake nearly tripled in mice fat cells exposed to the red rice bran extracts and more than doubled in cells exposed to the purple rice bran extracts. “Certain compounds called ‘phenolics’ in the bran bind these enzymes and alter their activity,” says Boue. Although the scientists demonstrated the potential of red and purple bran extracts in regulating glucose uptake in mouse fat cells, additional research with humans is needed to demonstrate the same positive effect. The number of people with diabetes today in the United States is six times greater than it was in the 1950s. Diabetes affects more than 29 million Americans and 422 million people worldwide. In addition, about 79 million U.S. adults are at high risk of developing type II diabetes and other serious health problems. Without proper medical care, diabetes can lead to heart attack, stroke, blindness, kidney failure, and nerve damage.—By Sandra Avant, ARS Office of Communications. Diabetes affects more than 29 million Americans. People with diabetes must manage their blood glucose (sugar) levels. Medications can improve glucose uptake in people with diabetes. ARS found colored rice bran extracts increase glucose (sugar) use in mouse fat cells.